If you’re shocked by the costs your printer incurs—and who isn’t?—then this guide is for you. Learn how to slash printing costs by making some simple and free tweaks to your printing routine and print settings. Printing costs, especially if you have an inkjet printer, are astronomical. Today we’re taking a look at techniques you can use to minimize your printing costs. The majority of the techniques don’t cost you a dime and those that do will save you piles of cash in the long run. Email documents to the recipient instead of printing them. This seems painfully elementary but quite a few people, especially in corporate environments, have simply got in the habit of firing up the printer left and right when it would be cheaper, more efficient, and environmentally friendly to email the document. Use your smartphone for directions instead of printing a map—an added bonus here is that you can get new directions automatically if you screw things up. Even if you don’t have a GPS enabled phone just cutting and pasting the directions for use on your phone helps. Transfer articles to your tablet or smart phone for comfortable away-from-computer reading. Tools like Send to Kindle for Google Chrome and Read It Later’s support for sending articles to your ereader make it easy to shuttle what you want to read to your portable device. With a little digging you can find all manner of tools for your specific device or reading needs. These are but a few examples of how you can keep things digital and cut down on your printing costs in the process. Home printing and the accompanying printers have never been intended to take over the role of your local copy shop or photo lab. Sure it’s convenient to have a home printer to print whenever you want but you’re paying a premium for that convenience. When you factor in the cost of the printer, the cost of the ink/toner, the cost of the electricity, the wear and tear, and the paper cost you’re either paying more than you would at a copy shop or breaking about even. Sometimes breaking even isn’t really breaking even either, especially when it comes to color and photo printing where home machines generally give lackluster results. Speaking of color photos, don’t print them at home. The amount of money you’ll spend chasing lab-quality prints is high and the chance you’ll end up with the same quality that the ten cent 4x6s from your local Walgreen’s photo kiosk have is low. At any reasonable consumer price point you’re just not going to get the kind of quality that will ensure your photos still look good a few years down the road. For small volume printing those photo kiosks are actually a great deal compared to trying to print photos at home. Doing a lot of photo printing? You should use a price comparison service like this one to find the best value for your needs. If you’re willing to wait a week or two to get the prints in the mail you can save a mint. For the most part the same thing applies to color documents. The crappiest color copier at your local copy shop is still ten times better than that inkjet you got free with your computer—and way cheaper for you to use for your intermittent color printing needs. Think in terms of cost and wasted material. If you print color pages a few times a year then it’s a complete money sink for you to have an inkjet printer. Spend $5 on a flash drive and use that to cart files back and forth to the copy shop when you need a presentation printed. That’s all well and good, you say, but what about saving money with the printer sitting on my desk right now? Fair enough! As much money as you can save by reducing your printing needs and outsourcing the large and/or costly jobs, you can save even more by making small changes. First, get in the habit of looking at print jobs with the lens of “What can I do to reduce the size of this job?” at all times. Some things are simple to do like using the print preview button to make sure you’re not printing blank pages at the end of the web site you’re about to print off. If you’re not using the print preview you’re just asking to end up with all sorts of crap out of the printer. When you preview you can see if the document will look the way you want on the page and you can also see if the last page will, for example, be nothing but the web site footer and a big ad for Car Fax. Second, start shrinking your print size. Can you shrink to fit the page and still read it? Can you double your printing mileage by 2-upping or even 4-upping your document? As long as you have your reading glasses handy 2-up for regular documents and 4-up for presentations like PowerPoint slides are completely legible. Adobe Acrobat, Microsoft Word, and most major document reading and editing applications support shrink to fit and n-up page printing. Switch to draft mode as the default setting. Depending on your printer the actual title will vary. Some companies call it “draft mode” others call it “toner saver”, “print saver”, “economy” and so on. Regardless of the name it’s a setting or series of settings that allow you to dial back how much ink and toner your using. For simple things like articles and basic documents you’ll likely not even notice the difference. If you do notice it won’t likely decrease your ease of reading. What it will do is radically cut down on how much ink and toner you’ll laying down on the paper. Earlier we suggested using the print preview in order to see what your printer was cranking out before it wasted the ink. Selective printing is an even more aggressive approach where you hack out or otherwise edit prints before they spool up, saving yourself a bundle in the process. A variety of solutions exist to help people conserve ink and toner by selectively printing. When printing from the web, PrintWhatYouLike.com is a great resource for on-the-fly web site editing. By either plugging in the URL to their web site or launching the bookmarklet—seen in the screenshot above—you can quickly and easily edit a site and pull out the content you don’t want. Want the article, a few of the how-to photos you might need to reference, and that’s it? 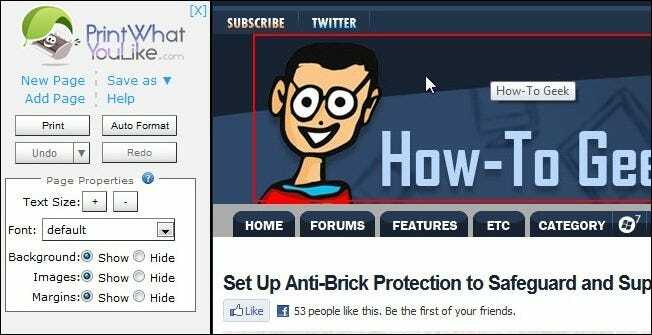 Go ahead and click on (and delete or resize) all the elements you don’t need. You can adjust the font size, selectively edit, and otherwise reduce the footprint of the document. Other web and bookmarklet-based solutions you may want to look at include The Printliminator, MyPage, and Print Friendly. If you want that functionality built in to your browser instead of using a third-party site or bookmark you should check out Printee for Internet Explorer and for Google Chrome, Print Edit for Firefox, and Nuke Everything Enhanced for Firefox. There’s no need to waste your paper and ink printing the ads, sidebars that can’t be clicked in hard copy, and other web-only elements. One final way you can save big is by manually refilling your toner and ink cartridges. Be forewarned, however, that this is one of those areas that either goes swimmingly well and you exclaim how you can’t believe you haven’t been doing it for years or it goes terribly wrong and you end up either wasting money or outright buying a new printer. This method is tricky not because it’s insanely difficult to pop a little cap off a toner drum and dump toner in but because print companies use all manner of cartridges and accompanying electronic mechanisms that make things difficult. Some Epson cartridges, for example, have a microchip on board that keeps track of prints and ink; you can’t just inject more ink into the cartridge and expect it to keep on trucking. Other cartridges are much easier to work with–one How-To Geek reader even showed us how he prolongs the life of his cartridges by simply injecting water into them. Fortunately there are plenty of resources online to help you. The best thing you can do is to search Google for the specific company and printer model you’re dealing with and do your research. Replacement ink and toner is available at a fraction of the price of retail ink. Find yourself a dependable printer that takes well to refills and a quality source for refill supplies and you’ll have a long and happy relationship. 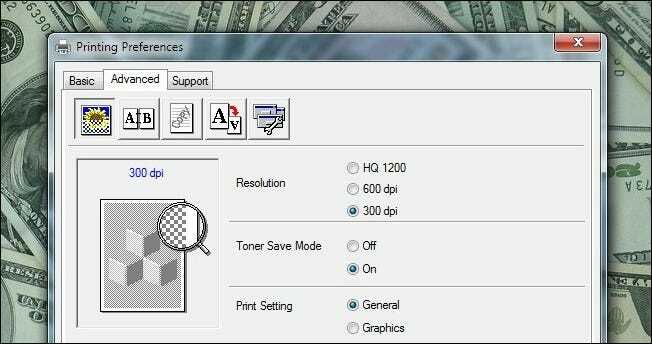 Have a tip, trick, or tool for saving on print costs? We want to hear about it in the comments. Have a detailed guide or a tip with photos? Shoot us an email at tips@howtogeek.com and you might just see it on the front page.